My recipe calls for more capers, garlic, and anchovies than are often used in puttanesca recipes; kale and chewy pasta balance the strong flavors. Even so, Kale Puttanesca is best served to those, like us, who like assertively seasoned food. To complement Kale Puttanesca sauce, I used Maccheroni al Ferratto, rustic artisanal pasta, originally from Calabria, that was traditionally shaped around iron umbrella spokes. Lately, I’ve been comparing regular dried pasta from the supermarket with more expensive “artisanal” pastas found in specialty stores and upscale markets. 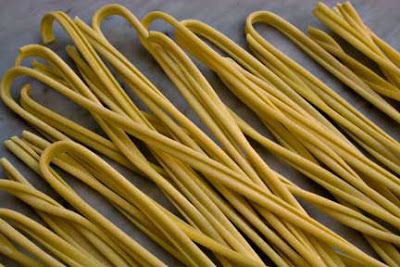 All dried pasta is made using extrusion dies, metal patterns that create unique pasta shapes. However, the dies used to make regular and artisanal pastas differ: regular pasta is made using dies with a Teflon insert and artisanal pasta is made with bronze dies. I prefer artisanal pasta with very simple pasta sauces, such as oil and garlic, where the texture of the pasta makes a significant difference. I also prefer artisanal pasta in dishes, like Kale Puttanesca, that call for thicker, chewier pastas. For all other purposes (and when I don’t want to spend the money on artisanal pasta) I happily use regular dried pasta from the supermarket. No matter what type of pasta you use, be sure to cook it al dente; soft, overdone pasta is the bane of even the best pasta sauce. Any sturdy green, wild or domesticated, can be substituted for kale. The amount of crushed red pepper depends on how spicy you like your food. Wash the kale to remove any dirt. Strip the greens from the tough center kale stems. Shred the kale greens and discard the stems (or save them for another use). Rinse the capers well. If using salt-cured capers, soak them in a bowl of cold water for at least 10 minutes. Fill a large pot with enough water to cook the pasta, salt it well, and put on a burner over high heat. Heat the olive oil until it's just warmed though, using a pan large enough to hold all the ingredients. (If oil is too hot, garlic will burn; it’s best to warm the oil over medium heat.) Stir in the garlic, anchovies, and red pepper flakes and cook, stirring, for 1 minute. Stir in the tomatoes, olives, freshly ground black pepper, shredded kale, and drained capers. Bring to a boil, cover, turn down the heat, and simmer for 20-30 minutes, or until the kale is tender. While the sauce is cooking, and when the salted water reaches a full boil, cook the pasta until it’s al dente (exact cooking time depends on the type of pasta). Reserve 1 cup of pasta cooking water. Drain the pasta. When the kale is tender, stir in the cooked pasta, making sure all of it is coated with sauce. Taste and add freshly ground black pepper, as needed. If the sauce is too thick for your taste, thin it with a little pasta cooking water. Serve immediately with plenty of crusty bread and a crisp green salad. This is my entry for Weekend Herb Blogging, sponsored by Haalo and hosted this week by Winnie from Healthy Green Kitchen. Beautiful Laurie! I love kale but have never thought to pair it with a puttanesca sauce. Yum! And thanks for the explanation regarding artisanal pasta vs supermarket brands...great reading (as always!). This looks delicious! I too love kale as well as "assertively seasoned foods", and I really appreciate your words of wisdom re: artisinal vs. regular pasta! Thanks for submitting this lovely post to weekend herb blogging! A nice, healthy twist on this classic dish Laurie!!! I knew this would be fantastic! I also prefer artisanal pasta. Great combinations in this recipe! I'm always tossing greens into pasta dishes because (a) I love my veggies and (b) I figure it balances out the carbs and eases my conscious. I like the idea of the putanesca flavor with it. 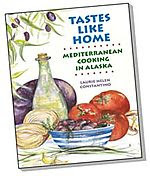 Thanks for stopping by by recipe page (I live in the Matanuska Valley). It's nice to meet another Alaska blogger. Lovely dish Laurie. And thank you for the information on pasta as I had never read up on any of that before ... it's great to know. I would never have thought of making this, but love this idea. Thank you for introducing it to us. Very interesting to read about the difference between artisanal and regular pasta. My favorite pasta is a brand of whole wheat pasta from Italy, but I don't know how it's made. Love the sound of this dish, and I am another one who likes assertively flavored foods! Wonderful stuff. I will certainly try this. Nice to see you back Laurie. 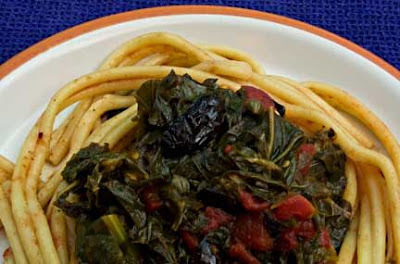 Kale and pasta together always make a perfect meal. I like artisanal pasta too, although any other good quality pasta will do. Great idea! I love greens and I love puttanesca so I think pairing the two would give the extra iron needed! nice Puttanesca twist, I will try it with swiss chard and/or spinach which are more widely available around here. Mediterranean Kiwi is right about some liking softer pasta- Greeks, North Africans and my MIL for example. Oh my goodness, this looks good! I have kale in the fridge . . . I think it looks so good it's going to be dinner tonight! I like your site, found you by looking for spinach recipes! I cook kale, collards, and most greens on a regular basis, I have put them in soup, but not a Putenesca sauce, so this sounds great!